In Canada, which is the first country to have a fighting chance of passing of passenger bill of rights before any other country in the free world, is under attack from the airline industry. The latest argument against the passenger bill of rights being raised by the airline industry, is that it will raise the cost of travel. Yes, apparently it is more economical to treat passengers like crap and the airline industry is incapable of increasing customer service, on time rates and lost baggage without raising the cost of air travel. Airfares will soar if a passenger bill of rights, proposed by Winnipeg MP Jim Maloway, is approved, Canada's airline industry has warned. Maloway tabled his private member's bill in the House of Commons Tuesday. 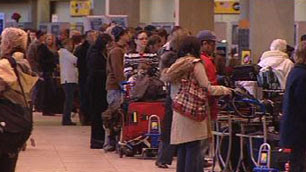 It proposes significant financial penalties to airlines for delayed or cancelled flights, even if it's due to poor weather, as happened to many Canadians during the Christmas holidays. Travellers would also be protected when bumped from a flight or if they experience baggage problems. Maloway, who represents the Elmwood-Transcona riding of Winnipeg, is also demanding full disclosure of advertised airfares. The bill would penalize airlines with fines of $10,000 every time the full cost of a flight isn't advertised.